Cannibalism is one of those taboos that seem to transcend all cultures, used to describe only the most deranged of villains or the most savage of primitive cultures. Surely civilized people could never commit such horrors, right? 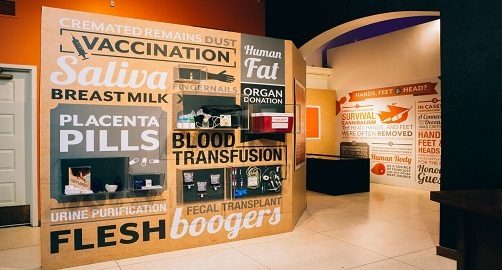 Well, San Diego’s Museum of Man hopes to put an end to some of these misconceptions with its new exhibit, Cannibals: Myth & Reality. Cannibalism is easy to demonize in theory, but the exhibit is designed to show its more tragic and desperate side. Remember the 1993 movie Alive, where survivors of a plane crash have to eat their dead to survive? It was based off of real events, and on display are the emotional testimonials from the actual survivors. Could you say, under such extreme circumstances, that you wouldn’t do the same? History claims that cannibals were mainly savages in uncivilized parts of the world, but Barrett refutes this. “We like to think cannibals are little brown people that live in the jungle, but in most cases it’s untrue. European countries could subjugate these people by claiming they were cannibals, and under their laws could sell them as slaves.” So really, how many innocent people have been enslaved based on a lie? Besides that, Cannibals: Myth & Reality wants you to realize that it was scarcely exclusive to primitive cultures. In fact, it was quite common in medicine. “We’ve got people grinding up the bodies of mummies to make medicine thinking it has magical properties. In the medical books of European kings there are recipes made of human bodies.” And it’s hardly ancient history; you can even find such examples today. The new mother who has her placenta turned into vitamins is a prime example. There are also interactive aspects to the exhibit, like the 8-bit video game Donner Trail. Based on the hit game Oregon Trail, it leads you through the path the infamous Donner Party took in 1846. As you come across the hardships and mistakes they made, you’ll be forced to make hard choices to survive. “If you play this little game, time and time again you’d make the same bad decisions and end up making the same hard decisions as the Donner Party,” says Barrett. 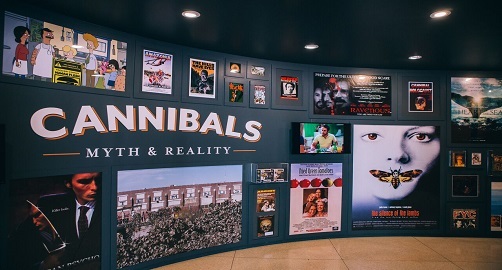 Cannibals: Myth & Reality will be open until the beginning of 2018, so don’t hesitate to see it.